March 2, 1942: General John L. DeWitt issued Public Proclamation No. 1, declaring that "such person or classes of persons as the situation may require" would, at some later point, be subject to exclusion orders from "Military Area No. 1" (essentially, the entire Pacific coast to about 100 miles (160.9 km) inland), and requiring anyone who had "enemy" ancestry to file a Change of Residence Notice if they planned to move. The Change of Residence section of the order was applicable to "any Japanese, German, or Italian alien, or any person of Japanese Ancestry," including U.S. citizens. The exclusion orders were to come later. 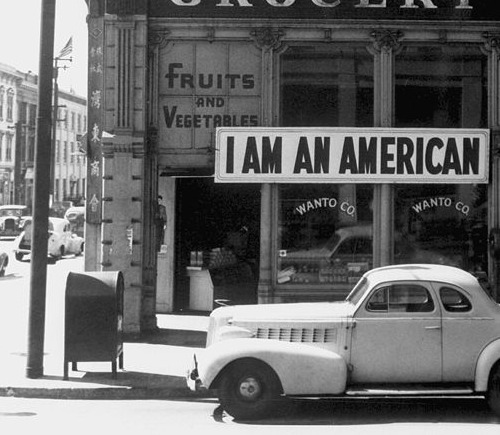 The photo below is of a large sign reading "I AM AN AMERICAN," placed in the window of a San Francisco grocery store, at 13th and Franklin streets, on December 8, 1941, the day after Pearl Harbor. The photograph was taken in March, 1942, shortly before the store was closed pursuant to exclusion orders made possible by Public Proclamation No. 1. At first, the exclusion orders directed persons of Japanese descent to evacuate from certain West Coast areas. Ultimately, the owner of this store, a University of California graduate, was detained along with hundreds of evacuees in War Relocation Authority centers for the duration of World War II. Photo by Dorothea Lange. Description above includes verbatim text from Library of Congress.